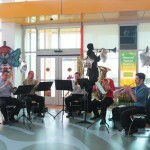 PSO musicians play for patients and families attending Music Around the World Day at Children’s Hospital of Pittsburgh of UPMC in September 2015. 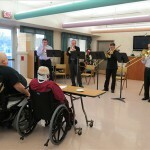 PSO musicians Chad Winkler, Bob Lauver, and Jim Nova, along with two university students, play Dixieland music for the February 2013 CHP Mardi Gras event. 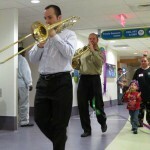 Jim and Bob play “When the Saints Go Marching In” as patients and their families march in CHP’s Mardi Gras parade. 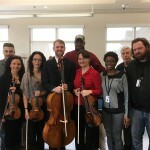 A PSO string quartet joins veterans and staff at the VA Pittsburgh’s H.J. Heinz Campus for a photo after an April 2016 event. 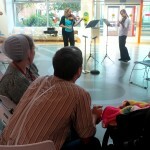 A string quartet of PSO musicians plays for patients and their families during a May 2014 Mother’s Day event at CHP. 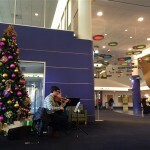 PSO violinists Andrew Fuller and Eva Burmeister fill the CHP lobby with the joyful strains of holiday music in December 2013. 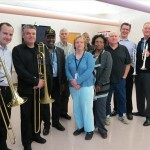 Veterans and staff at the VA Pittsburgh’s H.J. 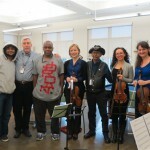 Heinz Campus pose with a PSO string quartet after a holiday musical event in December 2014. 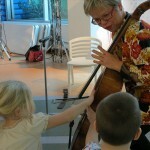 Anne serenades two CHP patients during the book reading. 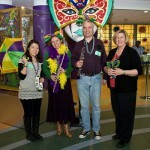 Gloria Mou, PSO Director of Musician and Community Engagement Programs, poses with PSO musicians, as well as CHP Music Therapist Deborah Benkovitz, at the February 2012 Mardi Gras event. 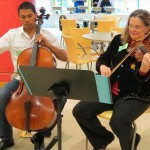 PSO violist Penny Brill and a PYSO cellist play for children and families attending the October 2012 Fiddlesticks and Pancakes breakfast at CHP. 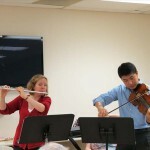 The PSO’s Principal Flute, Lorna McGhee, and violist Meng Wang play for veterans participating in a September 2012 cognitive therapy session at the VA.
PSO musicians Jeremy Black, Shanshan Yao, Penny Brill, and Gail Czajkowski play music to comfort those attending CHP’s September 2012 memorial service. 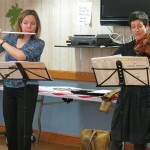 Ths PSO’s Principal Flute, Lorna McGhee, and Principal Second Violin, Jennifer Ross, play during a November 2013 cognitive therapy session at the VA.
PSO musicians Chad Winkler, Neal Berntsen, Peter Sullivan, and Jim Nova play holiday tunes for a group of veterans at the VA in December 2012. Veterans and VA staff pose with Jim, Peter, Chad, and Neal after the holiday event. 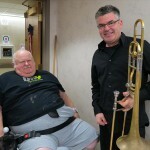 A veteran poses with the PSO’s Principal Trombone, Peter Sullivan, after enjoying holiday music at the VA.
On Saturday, June 27, 2015, the Pittsburgh Symphony Orchestra presented its first sensory-friendly orchestra concert, “Celebrate Pittsburgh.” Many families experienced the symphony together for the first time at this special event. Here’s how the day unfolded. 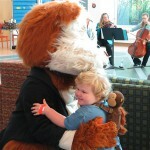 Virginia Dougherty, Music Therapist at the VA Pittsburgh Healthcare System’s H.J. 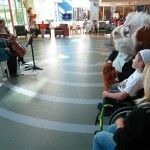 Heinz Campus, discusses how the PSO’s Music and Wellness sessions positively influence staff members’ perceptions of the value of music programs at the VA.
Deborah Benkovitz, Music Therapist at the Children’s Hospital of Pittsburgh of UPMC (CHP), tells a story about how two PSO musicians interacted with patients to provide a fun and memorable experience at the hospital’s annual Fiddlesticks and Pancakes breakfast. When a therapist at the VA sent the PSO’s Principal Flute, Lorna McGhee, an email thanking her for visiting veterans, Lorna sent a response explaining what playing for people in the community means to her. 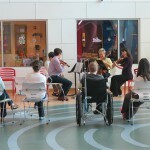 Music Therapist Deborah Benkovitz shares a story about how a holiday Music and Wellness session inspired one of her CHP patients to grow as a musician. 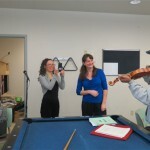 Music Therapist Virginia Dougherty tells a story about two veterans’ unique responses to the springtime and St. Patrick’s Day tunes that PSO musicians played at a cognitive group therapy session. 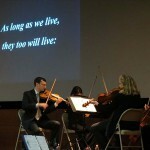 The PSO’s Principal Flute, Lorna McGhee, shares a story about how she used a piping tune to help cognitively stimulate veterans during a Music and Wellness session at the VA.
PSO Violist Penny Brill talks about how the PSO provides music that supports families who attend the CHP’s biannual memorial service after experiencing the loss of a child. 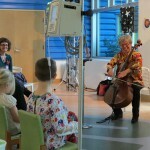 PSO Violist Penny Brill tells the story of how she was inspired to create the Music and Wellness Program to bring more music to Pittsburgh’s hospitals.